When I first started shooting open sights for PFT, I would zero the sights at about 14 or 15 yards and then shoot at all the other distances to find out the aim point. It worked OK, but getting this done was more difficult in the winter and pretty well required a trip to Burlington on the indoor range. It also required some estimating and guessing during the match. For the past year or so, I have been using Chairgun with good success. I measure the height of the front sight from the centre of the barrel to the top of the sight and use that as my scope height. I then use 25 yards as my zero distance, which I will explain soon. The pellet info is input and the start and finish distances of 10 and 25 yards are keyed in. The scope magnification and other data that makes no difference for open sights is just ignored. So my Alfa Project shoots the JSB 7.9s at about 495 fps and that info is put in the program. The sight height was 0.66" and that was entered along with the zero distance of 25 yards. The killzone is entered at 1.5", since that is the smallest zone that will be seen. 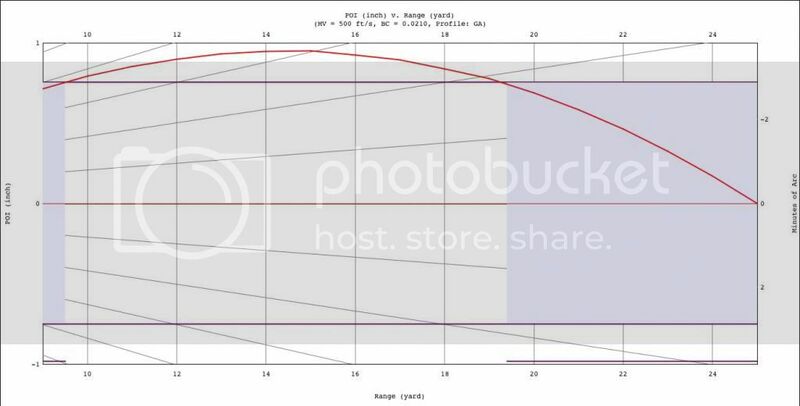 The chart provides the impact points as inches above or below the zero and the chart provides a visual that really shows the simplicity of knowing where to hold. The nice part with the 25 yard zero is that every aim point will be at or below the centre of the zone. Anyone that has shot these matches with open, iron sights knows that you do not want to be holding the sights any higher than this because you start to cover the zone. That certainly makes it difficult to hold in the right place since you can no longer see the spot you want to hit. At 20 to 25 yards, these sights will completely cover the hit zone, causing you to do a little guessing; not good. So on the right of the graph is the zero hold for 25 yards and you can see that every hit point is above this spot, meaning you have to hold lower. The apex is at 14-15 yards and the hold would be close to a quarter inch below the 1.5" hit zone, which is quite easy to do. The 10 yard hold would be pretty well at the bottom of the zone or a 6:00 o'clock hold; simple. That same hold at the bottom of the zone will work for 19 and twenty yards as well. From 21 to 25 yards, you simply start moving the aim a little higher in the zone until you reach the centre at 25 yards. So now that all the aim spots are known comes the real hard part, holding the sights perfectly aligned, very still and being able to see the hit zone clearly in order to know you are holding in the right spot. Like in rifle field target, the gun will do the job if the navigator does their part. I think I enjoy the challenge of the open sights the most in PFT. I have tried scoped, red dot and even aperture sights, all with pretty good success, but the open sight class keeps pulling me back. Hope this helps some of those that will be shooting the open sight class in PFT. Works for me too, Tim. pretty much just have to dot the I when you aim. I always love shooting open sights too, that's what pistol shooting is all about. Thanks for this information Tim, I didn't know that setting your front sight height to the scope height allowed this to work! Based on your score at Burlington, it works very well indeed! Perhaps I'll try open sights again! I imagine this will also work with a red dot setup too. Yes, when I used a red dot, I set it up the same way. I did not zero it the same, because the dot does not block out the hit zone the same as the open iron sights do. I tried to have the high point in the trajectory holding near the bottom of the hit zone and the real close and far held near the top of the zone. If you can rig something to create a small aperture on your glasses for your shooting eye, that will definitely help. I think they make small apertures that fasten to the lens with a small suction cup. Good to have another open sight shooter; has been the largest class on a few occasions. I'm considering making the switch to iron sights too, I did shoot iron sights before, but wasn't using this approach - and by looking at your numbers, you're never holding more than 1/4" below the Hit Zone. The real challenge is holding the pistol in such a way that gets it as far away from your eyes as possible while staying steady - a fun challenge! I have also changed my tactic a little. I no longer centre for 25 yards in the same way. I do centre for 25 yards, but I do it with a 6 o'clock hold. So at 25 yards, I sit the bottom of the zone right even with the top of the sight. So this puts my aim about an inch low at 10 yards and slightly over an inch at 14-15 yards. I use the size of the hit zone to gauge how far under I hold. The principle is the same and it would just be a matter of preference as to which one is used. I may try the one listed in the first post the next time I shoot, just for a comparison. I feel fairly fortunate at my age to be able to use the open sights with any kind of success and want to keep doing it while I can. I am sure the lens that focuses on the front sight of the pistol and the aperture are greats helps for me. The lens is about 8 -10 years old, so a new one may be needed soon.